Access and manage your contacts from anywhere. Backup solution in case you lose your phone. Bring your contacts to a new or second phone easily via automatic sync. 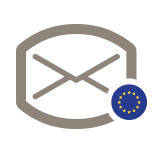 Commercial advertising to inbox.eu users without permission of SIA Inbokss is forbidden.